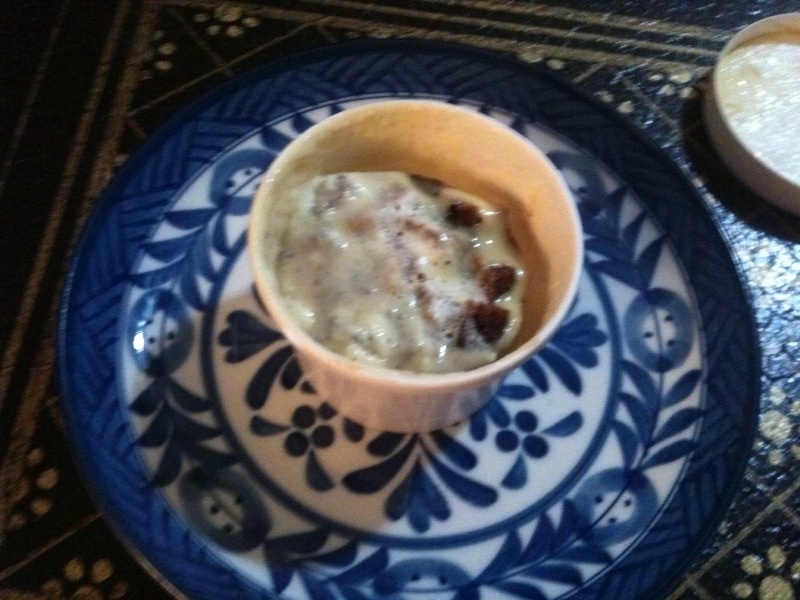 Chocolate Bread Pudding with Bacon Crème Anglaise from NYC’s Famous Dessert Truck! Spotting it there, parked at the curb, was a little like spotting a celebrity. Since finding out about the Dessert Truck, New York City’s cult foodie favorite, on the Food Network’s Throwdown with Bobby Flay I’ve been wishing and hoping for the chance to see if their chocolate bread pudding tastes as magical in real life as it looks on tv. 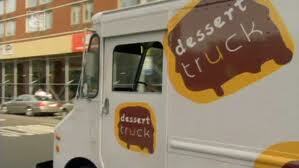 If you haven’t heard of the Dessert Truck, it’s exactly what it sounds like. Amazing idea, right? In my opinion, the truck’s founders, Jerome Chang (formerly the pastry sous chef at Le Cirque), and Columbia business school student Chris Chen, are scholars and gentlemen for making gourmet desserts mobile. Remember the warm fuzzy feeling you felt as a kid on Christmas Eve, knowing that Santa was out there somewhere in his sleigh, beginning to make his deliveries? That’s sort of how I think of the Dessert Truck, somewhere out there in New York City, bringing delicious $6 desserts to those lucky girls and boys who happen to be walking by. 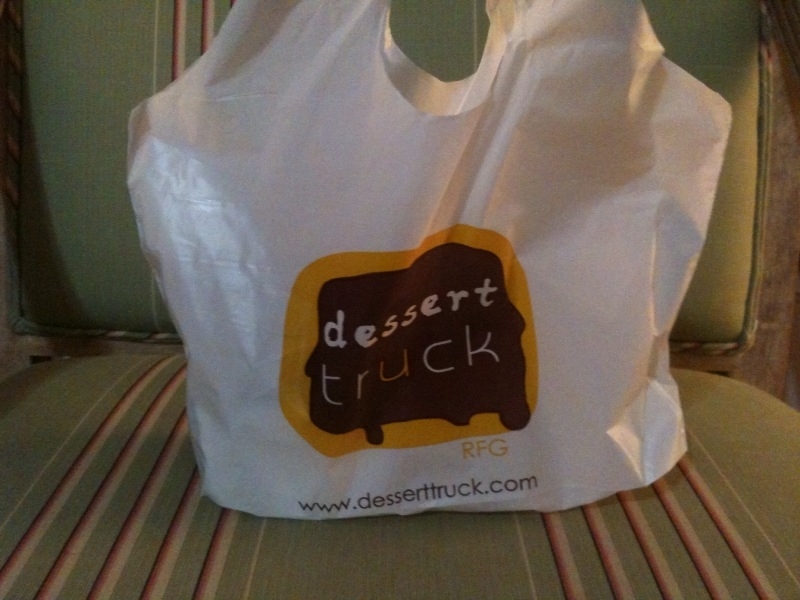 If you don't have room in your tummy when you happen upon the Dessert Truck, you can get it to-go, like I did! Tonight, that lucky girl was ME! I ordered DT’s famous chocolate bread pudding topped with bacon crème anglaise (if you don’t like bacon, you can get it with vanilla crème anglaise). 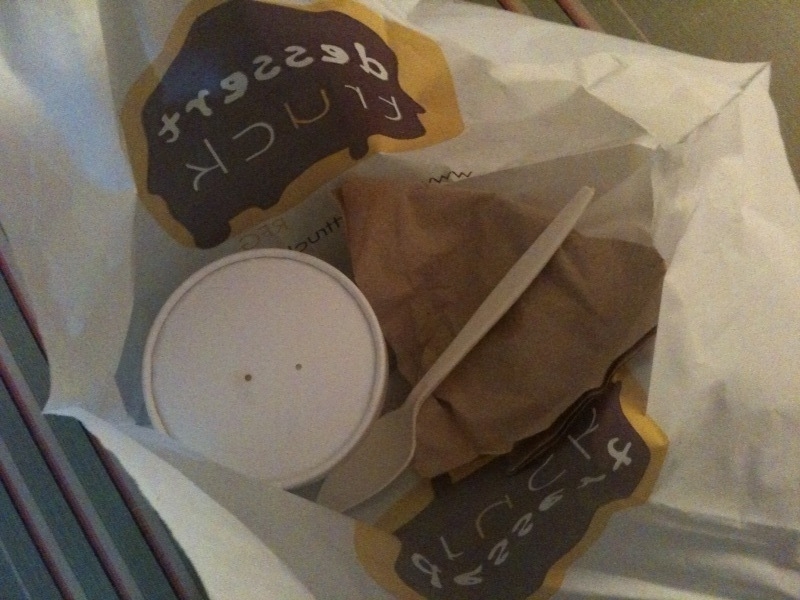 I thought that the bacon crème anglaise was pretty subtly flavored–it didn’t taste like pork, per say, just extra salty. 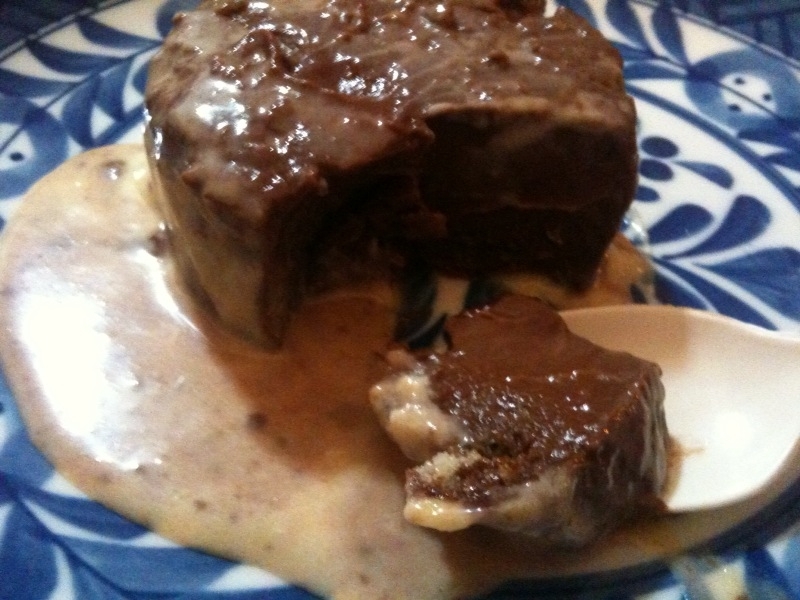 It made me wish the chocolate flavor of the bread pudding was a little more intense–sweeter, maybe even a bit on the bitter side–in order to adequately play off the salty crème anglaise. 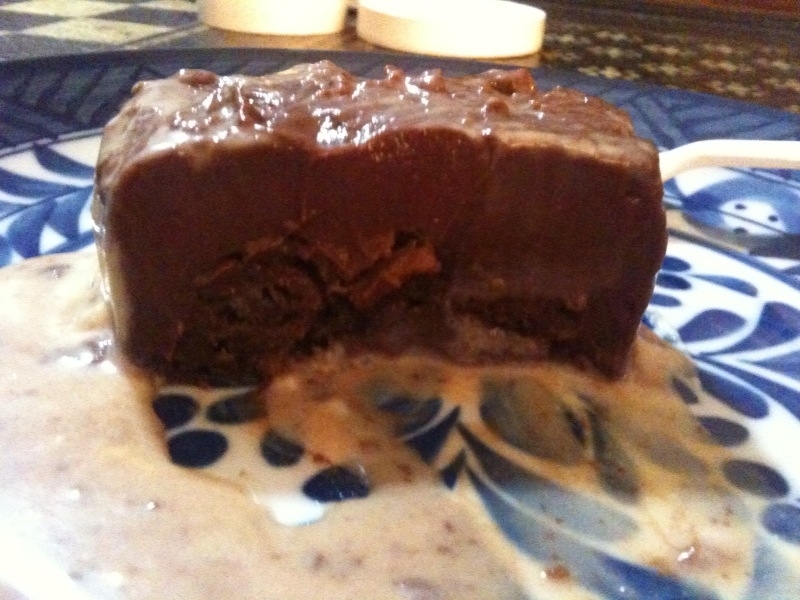 For presentation purposes, I flipped my pudding upside on a plate. The pudding was extremely smooth and custardy. I know from watching the Dessert Truck’s Throwdown episode that they soak their bread pudding overnight to make the bread extra rich and creamy–when you take a bite, you can definitely taste and feel this–the pudding truly has a soft, pudding-y mouth feel. I actually wish that the texture was a little more bready–I couldn’t tell the difference between the egg custard and the pieces of bread, and I actually like being able to distinguish between the two. 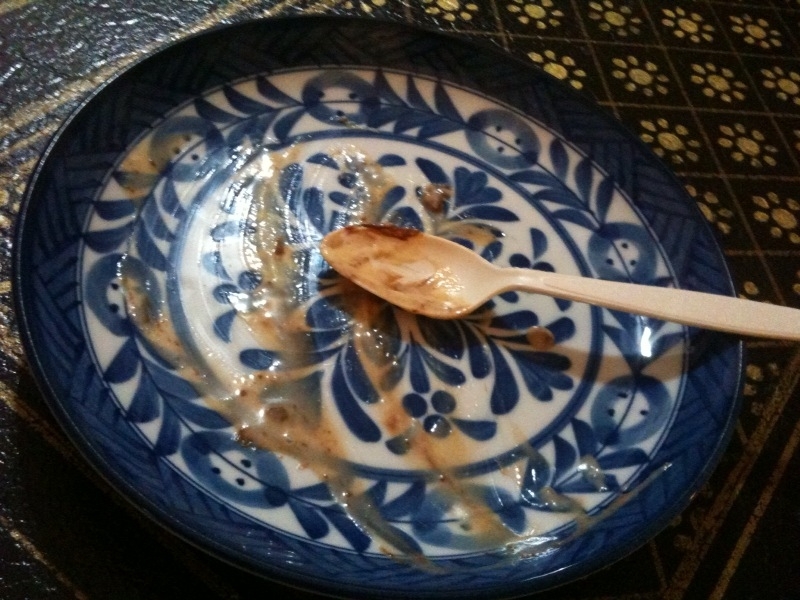 Speaking of the pudding’s egg custard, there was a lot of it–too much. 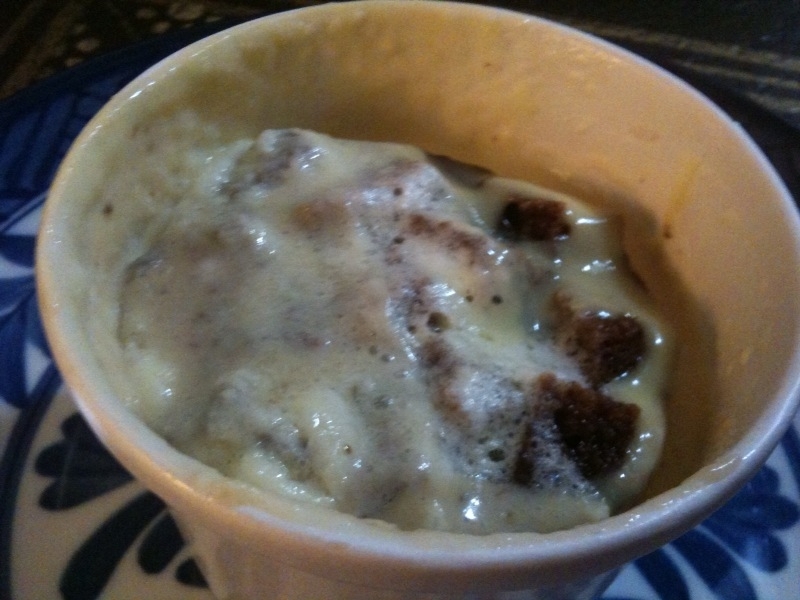 Check out this side view of the bread pudding–you can see that the Dessert Truck doesn’t use much bread–most of it (the entire top layer) was actually only egg custard, without any pieces of bread. Bread pudding is supposed to be just that–bread pudding–so I have to say that I enjoyed the inside center best, where there was the best bread + custard ratio. I hope that the Dessert Truck isn't skimping on bread to save some dough. So, what’s my final review? I have to say I was a little disappointed with my Dessert Truck experience. But, you can’t ever give up on Santa, and I won’t give up my faith in the Dessert Truck. That said, if you feel the way I do about bread pudding I’d definitely recommend trying something else–maybe their molten chocolate cake with sea salted pistachios. Doesn’t that sound delicious? Until next time, Dessert Truck. Until next time. Wow-that looks fantastic!! I can’t wait to find it next time I’m in NYC. 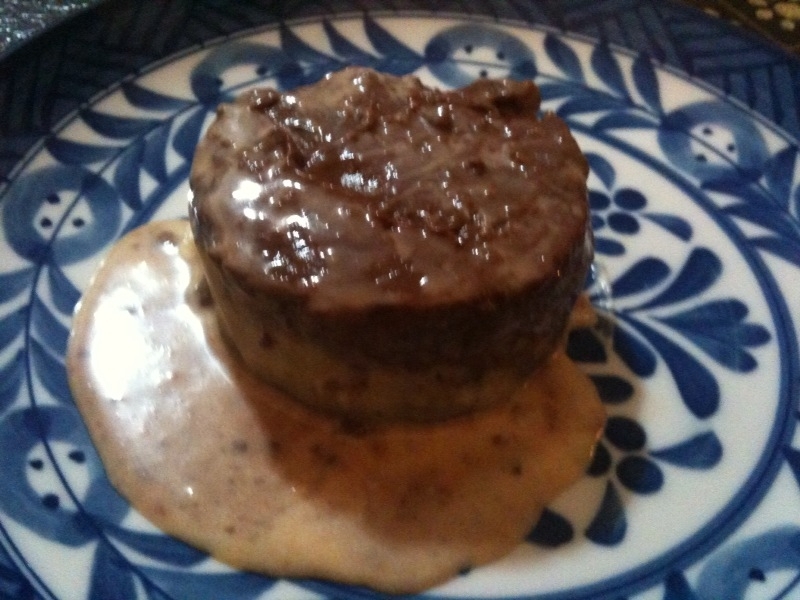 I love the Bacon Creme Anglaise–I am going to try that sometime. I have to say, it was really cool! Anyone into the sweet-savory thing would like it, I think. The bacon is just infused into the creme anglaise–so–depending on how strictly the vegetarians in your life interpret “vegetarian” food, it could possibly be a way for non-meat eaters to experience the bacon dessert trend :-). Cook the bacon in a skillet until well caramelized. In a small saucepot, bring half-and-half to a boil. Add the strips of bacon, but not the excess grease. Cover with plastic wrap or foil and let the bacon infuse for 15 minutes. Prepare an ice bath by placing an empty bowl into a large container of ice water. Add sugar to the half-and-half and boil mixture. Pour about half of the mixture over the yolks, whisk together, then pour back into the saucepot. Continuously stir the custard mix over medium-high heat with a wooden spoon until the custard no longer looks watery when a finger is drawn across the back of the spoon. Strain the custard into the bowl on the ice bath and let cool to room temperature. Refrigerate until cold. Store for up to 3 days. If you get a chance to try it, let me know what you think! I recently made this and it was amazing. Got rave reviews from all who ate it. That is great to hear! It is so delicious–perfect as a satisfying winter dessert!